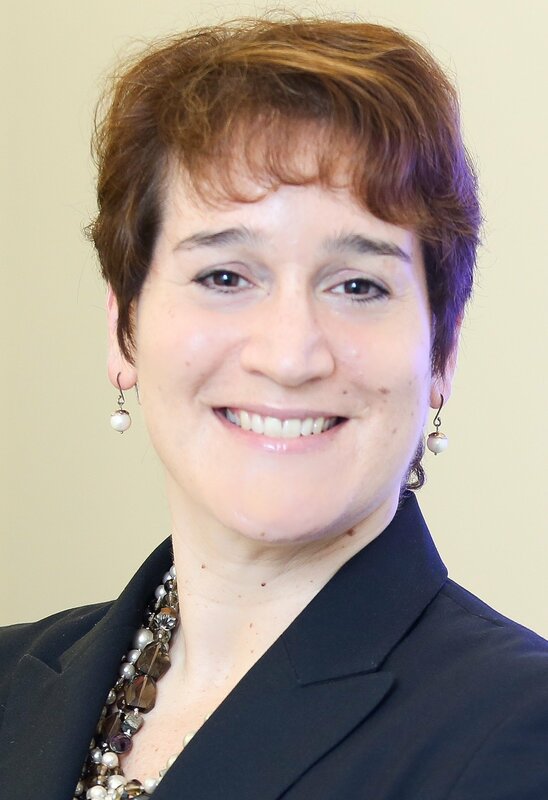 In July, the International Monetary Fund (IMF) published the interim update to its World Economic Outlook publication; the organization is projecting continued strength in the global economy but rising risks to the outlook. Global GDP growth is currently projected to increase from an estimated 3.7% in 2017 to 3.9% in 2018 and 2019. While the global growth forecast was unchanged from its April 2018 publication, there were some notable downward revisions. The forecasts for the world’s two largest economies, the U.S. and China, were unchanged from the April outlook; however, forecasts for Europe and Japan were revised lower due to disappointing Q1 2018 data. With this update, the IMF notes that downside economic risks have increased, including risks to the short-term outlook. The organization cites recent announcements of U.S. trade tariffs as threatening medium-term economic growth and global financial markets, in addition to the risks from rapid changes in monetary policy. In May, the Organization for Economic Cooperation and Development (OECD) released its Economic Outlook forecast. The updated forecast shows real GDP growth for the world of 3.8% in 2018 and 3.9% in 2019, an acceleration from the estimated 3.7% growth we saw in 2017. The organization points out that the current synchronized strong global economic growth is not the result of rising productivity gains or meaningful structural change; rather, the stronger economy is largely due to expansionary monetary and fiscal policy. While global growth will continue to strengthen over the next two years, the OECD highlighted rising economic and financial tensions that could threaten growth prospects in the medium term. These include escalating trade tensions, rising oil prices, and a rapid increase in interest rates. On the heels of a 2.2% expansion in 2017, the IMF is forecasting that U.S. economic growth will accelerate to 2.9% in 2018, followed by 2.7% growth in 2019. The forecast is unchanged from the April publication. The OECD forecast also calls for a 2.9% expansion in 2018, with a slightly more optimistic forecast of 2.8% for 2019. 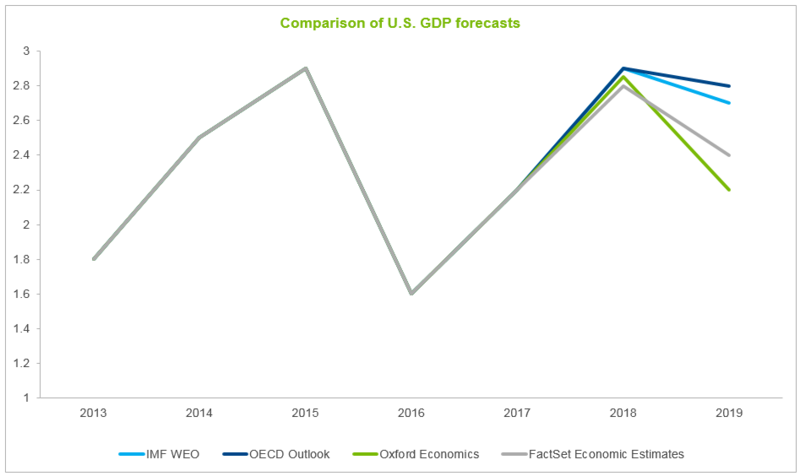 At the same time, the consensus forecast of analysts surveyed by FactSet shows an acceleration in 2018 to 2.8% growth followed by a sharper deceleration in 2019, to 2.4% growth. On a quarterly basis, the FactSet Economics consensus shows growth slowing in early 2019, likely in response to the accelerated pace of interest rate hikes by the Federal Reserve; current forecasts indicate a total of four hikes in 2018 and one or two more in 2019. Because of disappointing Q1 data, the forecasts for the eurozone have been lowered in the latest forecast updates. Following 2017 growth of 2.5%, the IMF is projecting 2.2% growth in 2018 and 1.9% growth in 2019 for the entire eurozone. These forecasts are lower than in the April WEO forecast, but remain significantly higher than the forecast from a year and a half ago; in January 2017, the IMF forecast was calling for 2018 growth of just 1.6%. Likewise, the OECD outlook has also been raised over the last 18 months, although the 2018 forecast was lowered slightly between March and May 2018; the OECD currently projects 2.2% growth in 2018 and 2.1% growth in 2019. 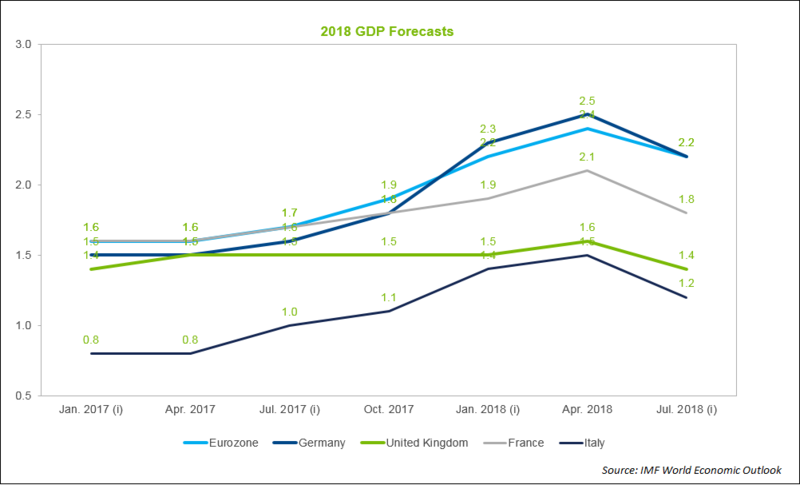 The FactSet Economic Estimates consensus forecast for the eurozone is roughly in line with both organizations, with a median forecast of 2.2% in 2018 and 1.9% in 2019. With both growth and inflation well under control, monetary policy is expected to remain expansionary through 2018, with ECB rate increases not expected to begin until 2019; however, the ECB recently reasserted its plan to end its monthly bond-buying program by the end of 2018. In the United Kingdom, the story continues to be Brexit. Uncertainty surrounding the UK’s exit from the European Union is hurting business confidence and the weak pound has boosted inflation and suppressed private consumption. Following a 1.7% expansion in 2017, the IMF forecast has real GDP growth slowing to 1.4% in 2018 and 1.5% in 2019. The OECD forecast also calls for 1.4% growth in 2018, but the 2019 growth projection is slightly weaker at 1.3%. 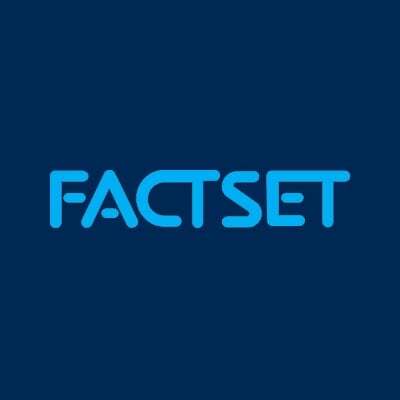 The FactSet consensus forecasts are slightly more pessimistic in the near term, projecting growth of 1.3% in 2018 and 1.4% in 2019. The combination of slowing growth accompanied by rising inflation puts the Bank of England in a tough spot; despite weak economic growth in Q1, inflation is a concern for the central bank. As expected, the BoE’s Monetary Policy Committee (MPC) raised rates by 25 basis points last week, the first rate hike since November 2017. Analysts surveyed by FactSet are expecting two more rate hikes in 2019. Economic growth in Asia is strong, but the growth trajectories vary widely across countries. While the IMF has growth for Japan lagging other countries at 1.0% and 0.9% in 2018 and 2019, respectively, the outlook for Japan has greatly improved over the last year and a half. In its January 2017 interim update, the IMF was projecting 2018 growth of just 0.5%. 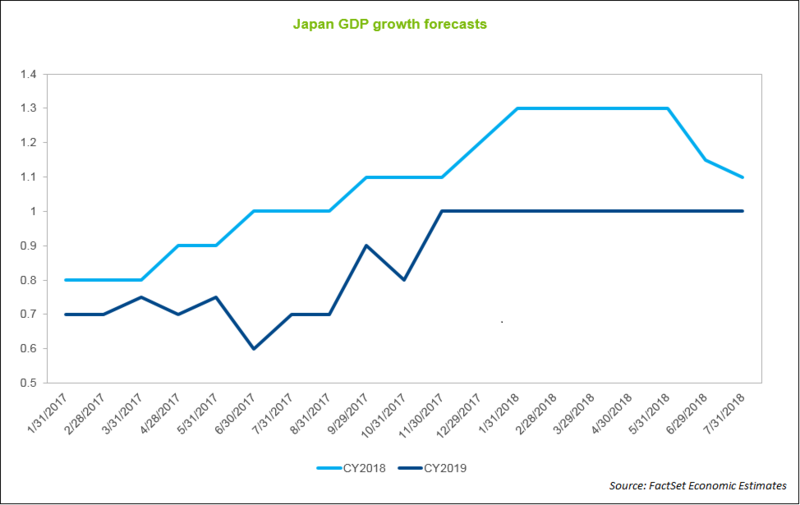 The OECD is even more optimistic, predicting that Japan will see growth of 1.2% in 2018 and 2019; back in November 2016, the organization was projecting just 0.8% growth in 2018. The FactSet median consensus forecast is forecasting 1.1% growth in 2018 and 1.0% in 2019. On the policy front, fiscal support is encouraging domestic consumption, and monetary policy is expected to remain on hold at least through 2019. In China, 2017 economic growth of 6.9% was well ahead of the government’s 6.5% target. The IMF is projecting growth to slow to 6.6% in 2018 and 6.4% in 2019; the OECD forecast is very similar, with a forecast for 6.7% growth in 2018 followed by 6.4% in 2019. 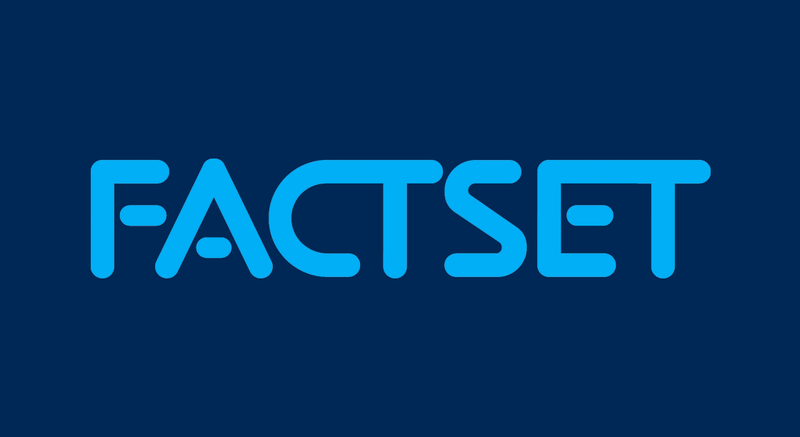 The FactSet Economic Estimates consensus is roughly in line with both organizations; the consensus estimate shows 6.6% growth in 2018 and 6.3% in 2019. 2017 growth was boosted by strong external demand; while this is likely to continue into 2018, tighter financial regulations should help to reduce domestic financial risks, which will likely suppress domestic demand. As we enter the second half of 2018, we’re starting to see the end of the synchronized global growth that has prevailed over the last two years. While the U.S. economy remains strong, growth in Europe and Japan is moderating, and emerging markets are under increasing economic and financial market pressure. The key things to watch over the next few quarters will be the impact of rising trade tensions, global inflation trends, and the pace of central bank monetary policy changes. All of these factors are likely to determine the path of global economic growth over the next few quarters and years.